The Klask Board Game - It's Time To Shake Up Family Game Night! Test your kids' coordination skills with “The Klask”! 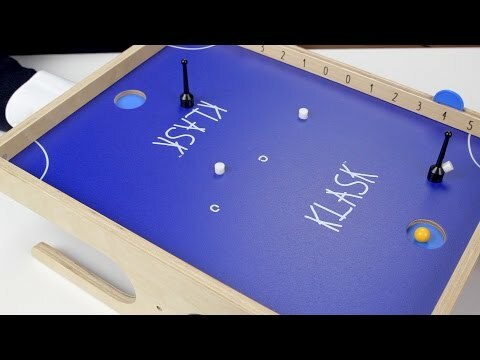 The Klask Board Game is sort of a combination of two popular games: Foosball and Air Hockey. The main idea behind the game is fairly simple, hit the ball into the opposing goal. But their is a twist, you have to avoid the obstacles! You play by moving your player using a magnet on the bottom of the board, but it’s not as easy as you think… things get tricky because you also have to maneuver around tiny white magnets (obstacles). Get too close to one and BOOM, it attaches to you. If you let it happen a second time… your opponent gets an extra point and you are on your way to losing. The Klask Board Game is a fantastic game that not only tests kids’ coordination, but parents as well. It’s not as easy as you think! Looking For Something Different Than The Klask Board Game? Have a look at our Games section for more interesting ideas.